We have replacement AYP Interlock Switches, PTO Switches and Safety Switches for your AYP equipment. 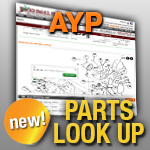 So, if you need a new replacement AYP switch, look below to find the right replacement part. We also have replacement AYP seat switches, so if you need one, check below or check our Universal Seat Switches.